Today, the First Flight Commemorative Half Dollar Coin remembers the loss of the Campbell Air Ship on July 16, 1889. Loss of the Campbell Air Ship. Shortly after 10 o’clock on the morning of July 16, Prof. E. D. Hogan, an aeronaut of considerable previous experience, made an ascent from Brooklyn in the air ship shown in the accompanying illustration. This air ship is the invention of Mr. Peter C. Campbell, of Brooklyn, and had as its most prominent feature an ovoid-shaped balloon, about sixty feet in length, made of fine Japanese silk, imported expressly for the work. Especial interest was felt in this ascension from the fact that it was claimed that the aeronaut would, with the various mechanisms provided, be able to control the movement of the balloon so as to practically navigate the air, moving in any direction with or against the wind, and at a greater or less elevation, as desired, an attainment which had, apparently, been achieved in some brief trials had last year at Coney Island. The ascent was made from the works of the Nassau Gas Company, where a pipe from a large meter was connected with the balloon to supply the lifting power. The meter showed that 15,027 feet of gas was used, the balloon being filled at about 10 o’clock, when the ropes were tested and some sand bags attached to the network and placed in the car. Shortly after this Prof. Hogan entered the car and gave the word to “Let her go,” when the ropes were cut and the air ship shot upward, amid the cheers of a crowd of spectators which had collected in the vicinity. The start was made in a southeasterly direction, owing to a brisk wind from the northwest, although the aeronaut was seen to be vigorously turning a crank which kept the steering apparatus and propelling wheels revolving rapidly, with the evident intention to compel the ship to face the wind. When about a mile distant, the large bottom wheel, intended to raise and lower the ship, became detached and fell to the ground. An hour after the start the air ship was seen to be under full way toward the Atlantic Ocean, on the south side of Long Island, and at an elevation estimated to be several thousand feet. The suspended car and attachments were reported to have had the appearance of being greatly disarranged, and it appeared as though a man was clinging to the netting of the balloon. At 12:30, or about two hours after starting, the air ship vanished from view. From this time the accounts of the voyage of the airship are conflicting. A New York pilot boat reported sighting a big, yellow, oval-shaped balloon, dragging in the ocean, late in the afternoon of the 16th, 74 miles southeast of the eastern end of Long Island. Chase was given, but when within three quarters of a mile the balloon broke away from the fastenings that were holding it down to the surface of the water and soared away to the southeast. The pilot boat found no trace of any car or any human being. There was also a report of an unknown balloon having been seen over Providence, R. I., on Tuesday evening, and a report that a balloon had been seen over Astoria, L. I., near where the air ship started, about midnight on Tuesday; but in neither case was there anything showing what had become of the aeronaut. Other indefinite reports mention a balloon having been seen at sea, but they are too vague to base any hope upon. In the construction of this air ship the car is suspended from the balloon through an intermediate rigid bar extending over and from end to end of the car by means of suspending cords from the frame of the car to the bar, which are made fast also to the harness or netting of the balloon. The center of the car is circular in shape, and has a circular seat with arched guards reaching upward to: the bar above. Extending fore and aft is a vertical keel, made of light framework, supporting a web of woven material. Nearly all of the framework of the car and its attachments was of wood and rattan, iron being very sparingly used, while the principal shafts and rods were hollow, and a thin fabric was used in the rudder and wings. The entire cost of the air ship is said to have been about $3,000. Upon the two sides of the car are hinged wings so adjusted to the car as to allow a vertical movement at right angles, the position of these wings with regard to the horizontal plane being governed by guy or sheet ropes, one set of these ropes passing from the upper and the outer surface of the wings to the upper part of the arched guards and to the bar above, and the second set to the lower part of the car. Both fore and aft of the circular body of the car, and projecting laterally from the keel, are arranged triangular guide wings hinged to the keel. and normally standing out from it in a horizontal position, but capable of being swung downwardly with the upper part of the keel as an axis. At the forward end of the car and its keel is hinged a vertical rudder, after the manner of the rudder of a boat, but of a size to extend both above and below the body of the car. This rudder is controlled by a crosshead and tiller rope extending to the center of the car. At the rear end of the car, and with its axis in line with the axis of the car, is mounted a propelling wheel, the driving shaft of which is made to extend forward and into the center of the car, where it terminates in a crank by which the propelling wheel may be rotated. Beneath the car is a second propelling wheel, more especially designed to control the ascent and descent of the ship; it is mounted upon a vertical shaft extending upward through the bottom of the car, and also fitted with an operating crank. It was the intention of the inventor that the balloon should be of such size, as compared with the weight of the car and its propelling and steering apparatus, that its buoyancy, when filled with gas, would just counteract or balance the force of gravity on the complete device, so that only a small power would be necessary to overturn this balance, and raise or lower the machine in the air. Between the bar and balloon, and attached to both, is a web to assist in guiding the machine when moving in a horizontal direction, after the manner of the keel of a boat. Two oars are also provided to facilitate landing, and they are made in fan shape, with long handles, to work against the air when but little power is needed. To assist in turning the ship around quickly a propeller is worked from the fore part of the car, and one at each end of the rigid bar. Two anchors are provided, one for each end of the keel, from which they are suspended by cords running over pulleys to the center of the care, where they are attached to a small windlass. All of the machinery is worked from the center of the car. In the trial of the Campbell balloon at Coney Island last summer, it was apparently very easy to control and direct its course as desired. The balloon first ascended about three hundred feet, then was brought down to be photographed, afterward ascending to about five hundred feet, where it was brought to a standstill, then it was started on a short excursion and again brought back to the starting place, sailing part of the time nearly straight against a light wind. After this the balloon was propelled around very nearly in a circle, and seemed to be completely under the control of the aeronaut, Mr. James Allen, of Providence. The aeronaut, E. D. Hogan, was born in Canada in 1852, and at the age of 16 made his first balloon ascension at Jackson, Michigan. It is said that he has made over 200 ascensions. Last year he was accustomed to ascend twice a week from Rockaway Beach to a height of some 5000 feet, from whence he dropped to the ground by means of a parachute. Both the balloon and the parachute were made by himself, the balloon being inflated with hot air. 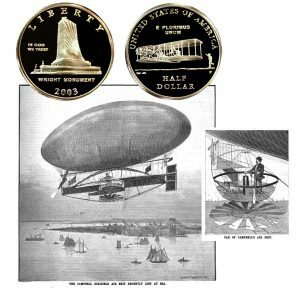 The First Flight Commemorative Half Dollar Coin shows with an artist’s image of the Campbell Air Ship, circa 1889.